This is the scene that greets the wife and me most mornings. All three kids inevitably find their way into our bed, to giggle and play with us. (Faith is underneath the blanket in this photo but trust me, she's in there too). For all the turmoil and uncertainty this year has brought, we've also experienced laughter and joy like this. 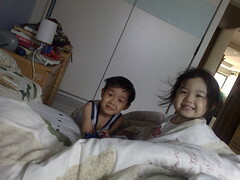 And this is what we choose to remember most... our kids jumping on our bed in the morning. May you be as blessed as we are in the coming year. We take a look at the preparations that go into setting up the fireworks for the countdown at Marina Bay. Did you know that fireworks shells look like coconuts? Get a ride of your life at mrbrownshow.com! There seems to be some confusion about the Marina Bay Singapore Countdown event and whether it is still on. Let's clear this up. ONLY the must-buy-ticket DANCE PARTY on the Marina Bay floating platform has been cancelled. The rest of the Marina Bay Singapore Countdown is STILL ON. You can still go down to the Esplanade on the 31st of December from 7pm onwards and enjoy free live band performances at the Esplanade Outdoor Theatre. The lighting of the Bay and the Wishing Spheres installation is still happening. AND the fireworks at midnight is still going to light up the skies around Marina Bay. In fact, you will be able to catch that from areas like the Esplanade waterfront, Merlion Park, Esplanade Bridge, One Fullerton and the Central Promontory Site. All this still for free. I hope that clears things up. I will see if I can put up a map of the fireworks viewing areas for you guys. Once again, the Dance Party on the Float is off, but the rest of the Marina Bay Singapore Countdown is on. Go forth and enjoy the fun and stop worrying. There will be about 300 video dedications done by personalities and people from all walks of life, for the Marina Bay Singapore Countdown plasma screens. This was my day shooting my bit. It was my 15 seconds of fame. We may not have turkey but we have a hearty dinner today, partly to celebrate Christmas and partly to celebrate my dad's birthday. 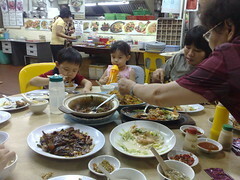 We took the public bus — grandma, grandpa, mommy, papa, the two maids, Faith, Isaac and Joy. Six adults and three kids, noisily getting onto the 113. We distributed the presents to the kids earlier today too. Isaac got his Transformers (an Optimus Prime and Megatron two-pack from the animated series). 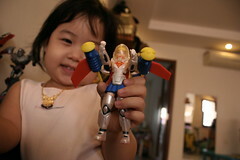 Joy got a Supergirl in battle armour (I was glad she asked for Supergirl instead of Barbie). And Faith got a Mickey Mouse squeeze toy and a giant Elmo from Uncle Dave (though the first thing she grabbed was the plastic bag the Elmo came in). The dishes were nice but I think we are going to have fried noodles for the next few days. Who over-ordered ah? Listen to this at your own risk. Meet Mr Nicholas, veteran of the Marina Bay Singapore Countdown and man in charge of installing the Wishing Spheres at the waterfront. Moving to a cheaper form of transport, one resident asked: "I would like to know... whether we are having, in the near future, a pro-bicycle government policy, where it can provide shady bicycle tracks all over the island." For now, Mr Lim said using two-wheelers as a form of transport is good for just intra-town travel. And it cannot be applied uniformly across the island but has to be adapted for different communities. I repeat what our transport minister said: "Using two-wheelers as a form of transport is good for just intra-town travel." Why ah? The bicycle will explode if ridden more than 2km, is it? Ang Mo Kio residents' legs will break off if they ride their bicycles to Serangoon ah? Lasers from outer space will disintegrate bicycles if the rider rides from Hougang to Shenton way ah? Maybe the minister heard of some urban legend about bicycles we were not privy to. I am sorry for having used my bicycle for riding beyond my estate then. I have been riding my bike beyond what it was good for, it seems. Tomorrow I go and add an extra wheel to my bike to satisfy the good minister's definition of what is good enough for country-wide travel. the mrbrown show: throw your mother's smelly shoes! Get rid of smelly dogs at mrbrownshow.com! We mean your shoes. Mr Lim explained: "This is because the public transport fare is not directly linked to the oil prices. We link it to national factors, like the inflation level in Singapore, and the wage level in the whole of Singapore." Good thing Singaporeans don't have the habit of expressing themselves with their shoes. It would be hard to dodge more than one pair. To reader Len: Yes, Singapore follows the Viagra Overdose School of Economics when it comes to prices — Easy to Go Up, Hard to Come Down. It is in HD (non-HD version can be seen at Youtube). Ride a folding bike with two empty panniers. I am shopping for the kids' toys at China Square. 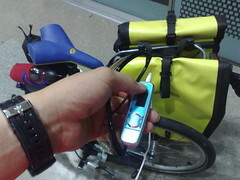 I have my wallet, my phone, a 1GB Sony mp3 player, and the bike. I spoke to some of the nice folks from the community homes who went to the Esplanade to sign and toss their Wishing Spheres into the waterfront. Apparently, some readers got inspired by the video of the folk from the community homes throwing the Wishing Spheres into the waters and decided to do it themselves. Eh, that was a special event lah. The Spheres must be installed specially by professionals, ok? So please do not toss your Wishing Spheres into the waterfront yourself. It will end up floating to Sentosa, Batam or the New York. Uncle Nicholas and his team has to go out there by boat and take your sphere back, then reinstall it for you. Very siong one. Please hand your Sphere back to the staff to be installed properly. Thank you hor. Oh, by the way, in addition to writing on Wishing Spheres, you can also make online wishes via the Marina Bay Countdown website. Featured comment by ahkow: "His train is better than SMRT; Joy has a seat!" Featured comment by Corrine: "This is fantastic!!! (In OT we call this Object Substitution i.e. being able to see beyond the functional use of the item and use it imaginatively in play)"
Isaac pulled me over one morning to show me his new creation, a train made up of various chairs and stools from the house. I have to admit it really looked like a decent train. It even had a lever and a "steering wheel". His younger sister, Joy, wanted to join in too and asked if she could get a ride. 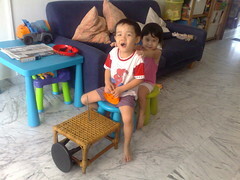 So we added one more stool and they were off, with Isaac declaring, "Choo choo! All aboard!" Must be because of the Thomas the Tank Engine books he so loves. It even looks a little like Thomas. A child's imagination is a marvelous thing. 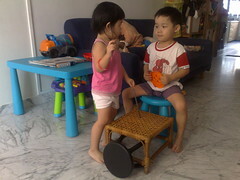 If only we grown-ups can see a train from a couple of stools and chairs. I am always happy to see the kids come up with toys with their own imagination. It's better for them, and cheaper for me. It's certainly better than having to buy every dang robot/doll/superhero that a movie or tv cartoon series pitches at the kids. My wife asked me last night if I enjoyed the Swiss Roll cake. "How did you know I ate one?" I said, surprised. I had eaten it while she was tending to the kids in the other room. "Oh, I read your Twitter." Now this is just... sad. The Greater Grace Temple in Detroit put three SUVs on stage for a service focused on getting God to convince Congress to approve a bailout for the US auto industry. I didn't know God had a soft spot for SUVs. According to a Reuters report: “At one point, Ellis summoned up hundreds of auto workers and retirees in the congregation to come forward toward the vehicles on the altar to be anointed with oil." They didn't say what oil was used, myrrh or Middle East Crude. Now I know WWJD really stands for "What Would Jesus Drive?". I was at the Esplanade, watching three community groups writing their wishes for the New Year, on Wishing Spheres and launching them onto the waters of Marina Bay. This is a live Qik video from the event. The spheres are part of a 10,000 sphere installation on the waterfront for the Marina Bay Singapore Countdown 2008. It looked like a really fun outing for them all, the young and the old from the three homes. I spoke to some of them and I'll share that with you guys soon. Featured comment from Wa Lan: "No wonder the Sing garment goes after you. Bush, al-Malaki and innocent people could have been injured or killed if it was an explosive device. What's the point of showing a clip of the three stooges via a silly loop? Immature and tasteless, Brown." CNN: "Bearing in mind, that in Iraqi culture, throwing a shoe is the close to the ultimate insult..."
Yes, and in other cultures, throwing a shoe is a sign of respect, affection and love. It makes you wonder though, that if the Secret Service could not stop a flying shoe or two, how were they planning to protect President Bush from more lethal weapons? Contrary to media reports, it was NOT shoes that were hurled at George Bush in Iraq. This was spotted on the internet, the REAL footage from the incident, it seems. Here is another possible scenario.